Only weeks after my husband, Ben, and I got engaged, we started planning our wedding. Though we really just wanted to bask in our love — or escape on a pre-wedding honeymoon — we needed to get our big event in order. First, we reserved the venue, which came with a caterer. Then, we booked a band. Then, we hired a florist. And then, I found my dress! Once all of those arrangements were set, I figured that we could relax. Until I realized that just because all of the necessary ingredients were in place didn’t mean that we’d have an incredible wedding. Your guests traveled from near and far, got babysitters, purchased gifts, and spent hours getting all dressed up — simply to celebrate you! 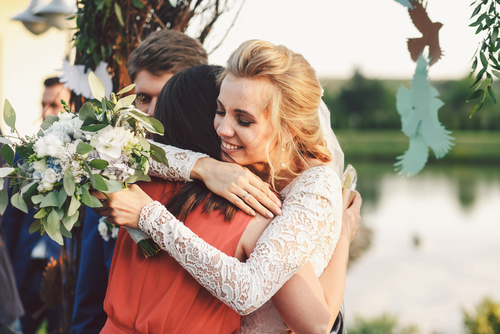 Your wedding will fly by, but make sure that it doesn’t end before you say hello to your wonderful guests. After a sweaty dance session, our guests settled down for their first course, which gave Ben and me about 15 minutes to visit each table and thank our guests for coming. With 225 people in attendance, we had about two minutes per table but we made it happen. People were thrilled to get some up-close time with the bride and groom, and we were thrilled to celebrate our special day with them. Our wedding party truly went above and beyond in making us feel loved by planning two surprise engagement parties for us, throwing bachelor and bachelorette parties, and showering us with love both before and during our special day. To show them how much their care meant to us, we gave them gifts on our wedding day. My bridesmaids got necklaces and their hair done. Ben’s groomsmen got lovely purple ties, which looked snazzy with their tuxedos. The main focus of a wedding is the couple getting hitched. But weddings are also a time to celebrate the couple’s village — everyone who helped the couple get where they are today. 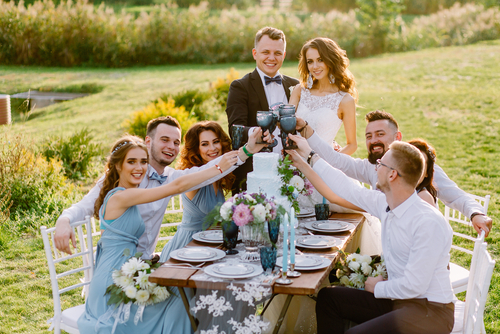 When creating a wedding slideshow, be sure to include lots of photos of family and friends in addition to cute childhood photos of the couple. Your friends and family will be thrilled to see themselves as a core part of your love journey. I have never received so many compliments than I did on my wedding day. Not only was my dress lauded countless times, but our guests showered Ben and me with their wishes for our future together. Love! Health! Happiness! Babies! I decided to repay the honor by sharing my hopes and dreams for them, too. The emotional day was filled with so many happy tears. We were truly thankful for each and every gift we received, but after writing our 100th thank you note, we couldn’t help but run out of new things to say. So, to personalize our thank yous, we created individual thank you notes that included photos of each of our guests celebrating at our wedding. Each thank you note was created with care and brought our guests back to our happy day. We even received a few thank yous for our thank you notes! 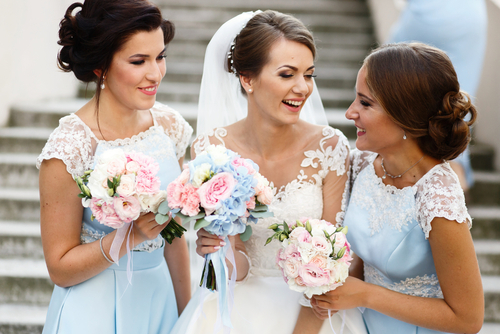 What are your tips for making a wedding even more memorable? Wonderful post! Thanks for sharing all the information regarding this. It was worth reading your post. You mentioned some valid points and the way of your writing is excellent. I think it’s very important to discuss everything with the planning of a wedding ceremony that will make it even more memorable. So that there will be no misunderstanding later. No doubt the information you shared here will help people regarding this.